I love this season…everything grows. The smell of flowers in the air. The Winter is long gone and the first fruits and veggies start to grow on the fields and in your own garden. This is a short, a precious time of the year. What if you had the chance to bring some of the summer smell into the Winter?! This warm..summerous taste of sweet and heavy fruits that brings back all your summer memories?? Well, you can and it is really, really simple! 🙂 Make your own jam or marmalade. Do I hear…oh noo, that’s too much work? Or maybe. D’uhhh that’s way too difficult??! 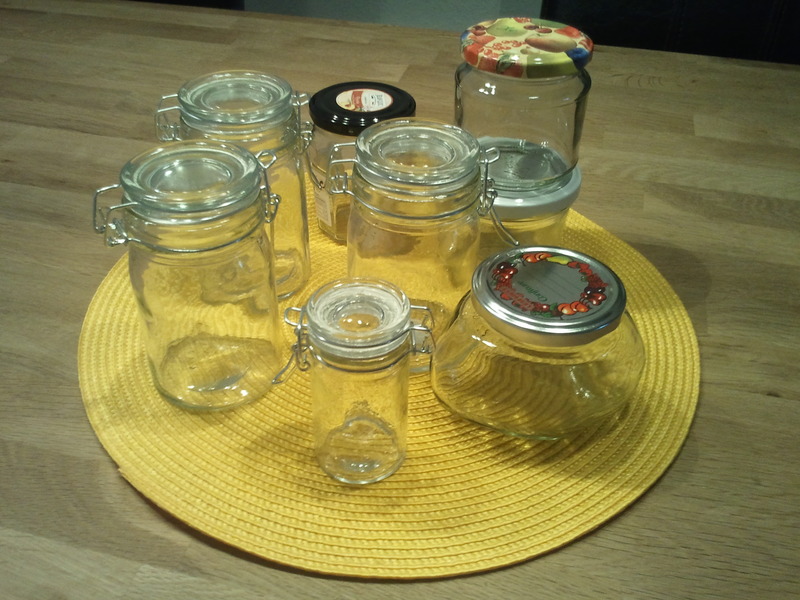 Before we get started we need some fresh glasses to preserve our homemade Jelly later. Be sure you wash them out with boiling water before using them. Wash the fruits and cut them into pieces. Be sure you weigh out the whole gram of fruits you need. Be exact on that! On the pack of my gelling sugar it says 1000 g fruits for 500g Sugar. So the proportion is 2:1 So more fruits than sugar. 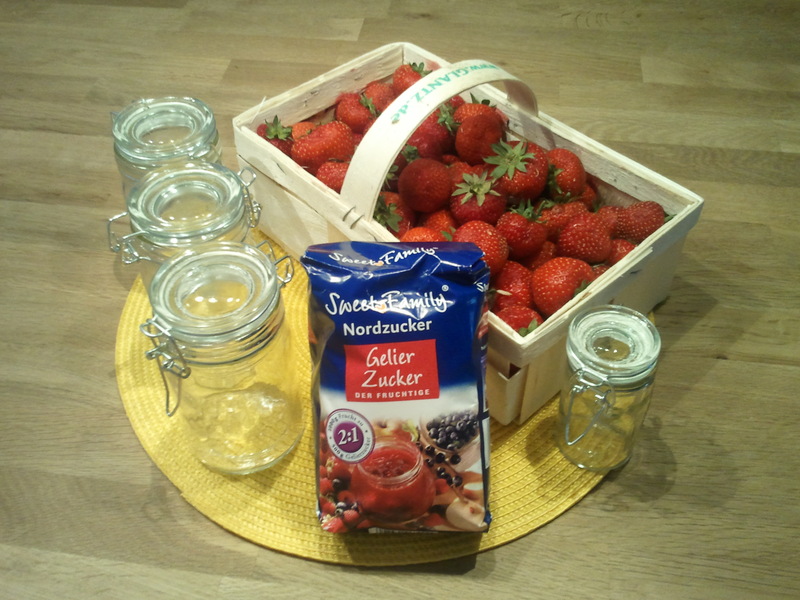 I like my jam with a smooth texture so I mix all the fruits with a hand- held blender, but if you like to have your jam with strawberry pieces leave them in pieces. 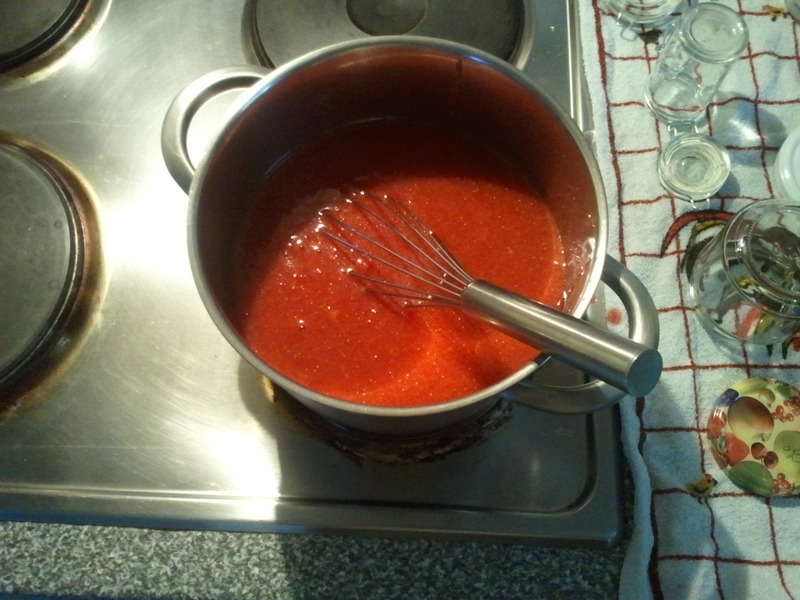 Bring the sugar and the fruits together and stir well so that you wont have any globs. I use to add a bit of Vanilla extract to the strawberry sugar mass to give the Jam a bit of a richer flavour but that’s just me. You don’t need to do that. 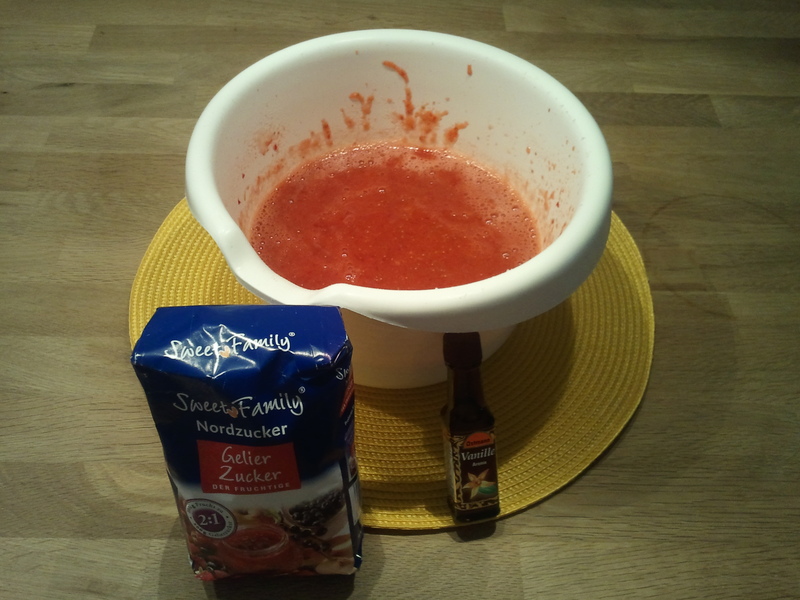 Put your Strawberry-Sugar- Mix into a large pot and heat it on a middle temperature so it’s slowly going to boil. Be sure you keep stiring all the time. If you see lots of bubbles rising and its boiling fast you take a look at your clock. The mass needs to boil exact 3 minutes on high temperatures while you stir all the time so that it wont get burned. 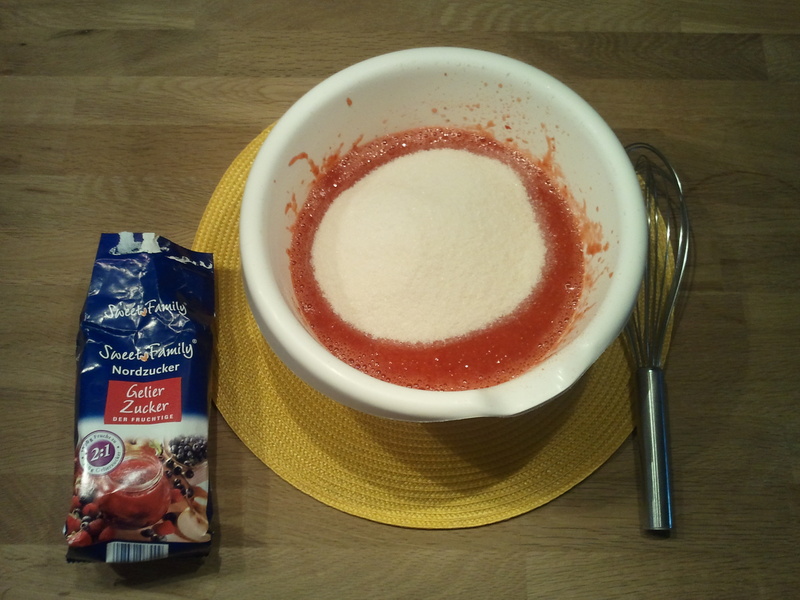 Pour your strawberry sugar Mix into your glasses but leave a bit of space above. Close with the lid. 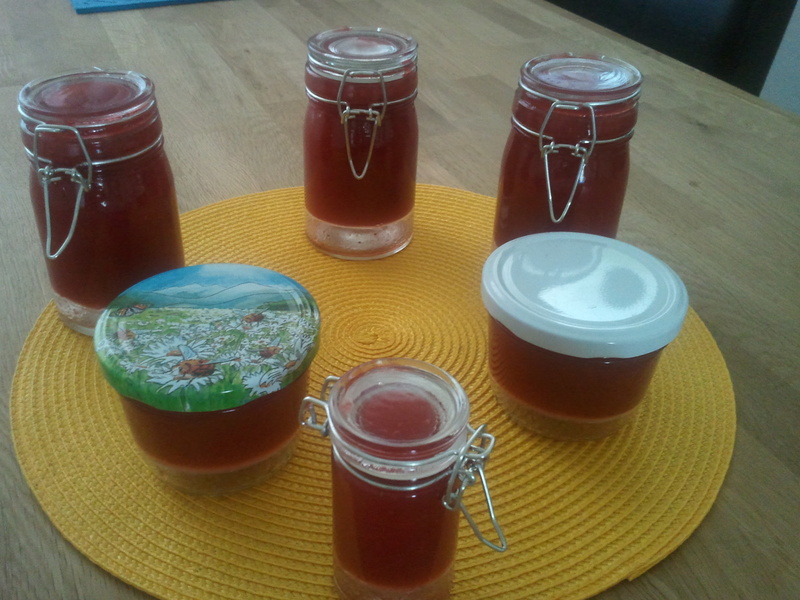 I know you are curious to try your own homemade jelly but leave it for a few days (3-4) so that the conservation is compleated after trying it for the first time. My congrats if you followed me all to the end you will have your own homemade Jelly in hands. 🙂 Its going to put a smile on your face every time you eat it. See, it wasnt that complicated. 🙂 I knew you would do it! So ENJOY and keep in mind that you have made your own product now. It’s all organic and you know exactly whats in it. Different from the Jam you buy in the Store. 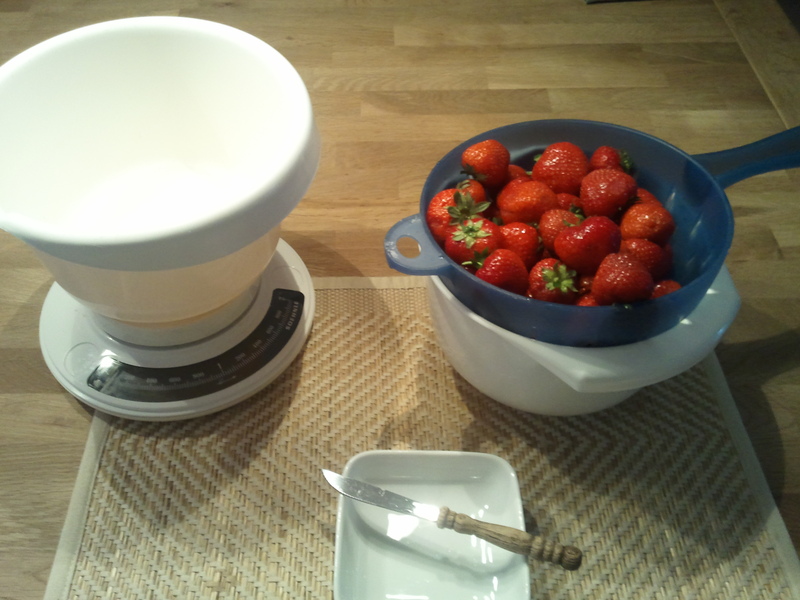 That is something that is important for me and this knowledge adds a little bonus to making your own Jam, I find. Wow, the time flies and May is almost at its end. It was a lovely month with really great and warm weather. Actually too warm for the season with no rain. Poor Farmers, I hope the plants are going to make it and wont be too expensive because of this dry period. I for myself really enjoyed this warm weather. This recipe is so easy, no cooking, no baking and only has 3g of fat! 85g of low-fat biscuits – I use oatmeal biscuits and add a dab of ginger or cinnamon depending on what I fancy. 1. Put the biscuits in a plastic bag and smash them up with a rolling-pin. Don’t worry if that there are chunks left in it, it adds texture. 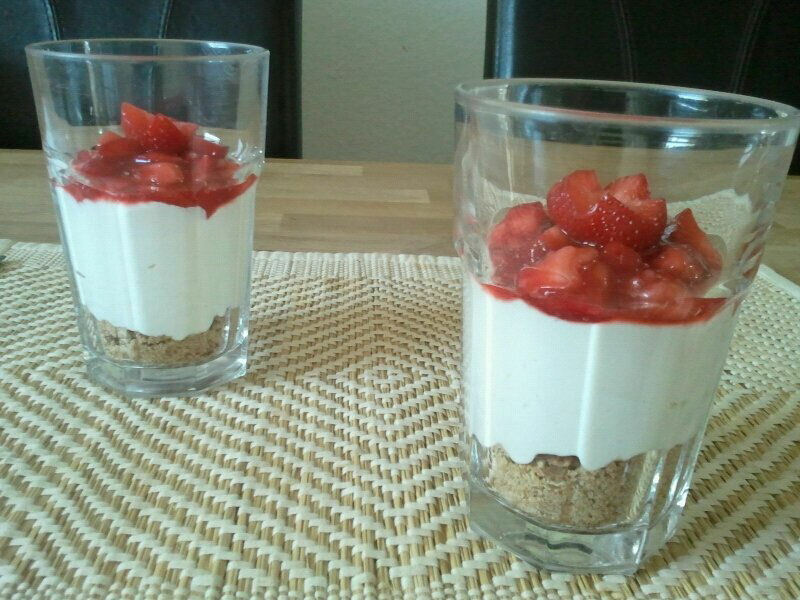 Divide the crumbs into 4 glasses/bowls. 2. Add the soft cheese, Greek yoghurt, sugar & vanilla into a bowl and beat them together until you have a smooth creamy mixture. Spoon this over the crumbs and at this point you can put them in the fridge and finish them off when you are ready to serve them. 3. Stir the jam in a bowl to loose it up. Chop up the fruit and gently mix them into the jam. Add the mixture to the top of the cheesecake. I took fresh Spinach and Broccoli but you can use frozen ones too. Remember that you have to blanch them before you add them to the spices! I loved that easy, healthy and vegan Dinner. It tasted so great with all its flavours and you def. don’t need any siders as the Chickpeas and Lentils fill the part. My third recipe this month has also Cream Cheese in it. I have to say that I really love that taste of it. Whether on a slice of break or in a Cake, Bars or as a Frosting on Cupcakes. 1. Preheat oven to 325°F (162 °C). Line a 9 x 13-inch pan with foil, leaving a 2-inch overhang on two sides (I spray mine with cooking spray). These work best served on flattened out cupcake papers with a fork stuck on top.